As I’ve mentioned before, we’re often looking for new recipes to make at home, to mix up our menus when we find ourselves stuck in a rut. While I’m not new to cooking curry dishes, many recipes I’ve tried in the past have involved more ingredients, steps, and time than I usually have available, especially for a weeknight supper. Thankfully, like chili or chicken soup, curry is adaptable and delicious in many forms. If you want more inspiration for your home cooking, check out Salt, Fat, Acid, Heat, a cookbook and companion documentary series from Samin Nosrat. The Incredible Spice Men also know how to jazz up traditional foods from the UK, giving old standbys like fish & chips or apple crumble a delicious twist. Naan bread, pita bread, or rice for serving. * For the spices, use either whole spices OR the spice mix you prefer. 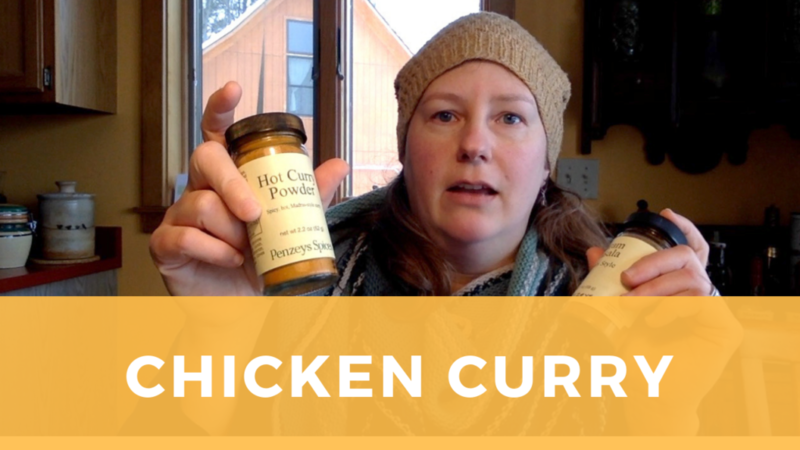 Use a combination of turmeric, cumin, cardamom, cayenne pepper, coriander, cloves, nutmeg, caraway, fenugreek, and Tellicherry black peppercorns. For this recipe I used about 1 tablespoon of hot curry powder and 1 teaspoon Garam Masala. In a large skillet or stove-top casserole dish, heat the cooking oil to medium heat and add the onions. Saute for 3 minutes, then add the ginger, garlic, and ground spices, and cook for another 2 minutes. Next, add the snow peas, chicken, and broth, stir well and cover for about 8 minutes, until the peas have gone a little tender (but not soft) and the chicken is heated through. Turn off the heat and stir in the yogurt to make a creamy sauce. Serve with either bread or rice, a squeeze of fresh lime, and a side of pickled vegetables, chutney, or fresh salad greens.